Pour juice in medium saucepan. Sprinkle with gelatin and allow to soak for a minute or two. Heat over very low heat, stirring constantly, until gelatin is dissolved, (about 5 minutes). Remove from heat. Stir in the vodka and liqueur. Pour two tablespoons or the gelatin mixture into each mini glass. Refrigerate until fully set, 1 to 2 hours. My husband and I aren’t usually “tux and gown gala” folks on New Years Eve, opting instead for more intimate gatherings. Of course, I still try to inject a tiny bit glamour into the evening--whether I am wearing jeans and UGGs or a cocktail skirt! Not surprisingly, my favorite cocktail for the turn of the year, the French Martini--made with pineapple juice, raspberry vodka, and Chambord (a raspberry liqueur)--doubles as a cocktail “accessory.” With its eye-catching shade of lavender-pink and raspberry garnish, it looks absolutely fetching in a martini glass! Plus, it’s a festive and refreshing choice after a season of heavy holiday ‘nogs and glogs. My contribution to this year’s festivities will be glitzy little French Martini Jelly Shots, set in tiny appetizer glasses. Any variety of mini cordial, martini or champagne glass will work well. The serving size is quite small--1 ounce / 2 tablespoons. The jelly shots could also be set in a standard 1 lb loaf pan (approximately 8” x 4”) and cut into squares, each garnished with half a raspberry. If you will be cutting the jelly shots to serve and anticipate they will be sitting out for a while, add an extra 1/2 to 1 envelope of plain gelatin to give them a little staying power. The recipe calls for raspberry vodka, however, don’t panic if you don’t happen to have raspberry vodka on hand. Plain vodka is fine as the Chambord adds so much raspberry flavor on its own. 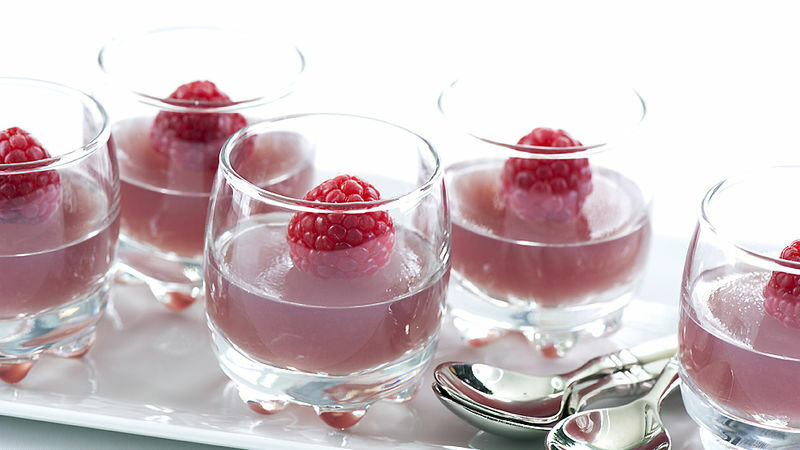 Michelle Palm created the Jelly Shot Test Kitchen blog after discovering a lack of cocktail-style jelly shot recipes.